How’s this year been for your business? Are you finally starting to see light at the end of the tunnel? Do you feel like business may be returning to levels you once enjoyed before the “great recession? Don’t get too comfortable. Sorry for the slap of reality, but I’m hearing too many small business owners sound uncomfortably optimistic about the future for their companies…and it’s making me nervous. Many of the same business owners banging the gong about their companies have yet to adequately address five factors that put them closer to the abyss in the first place. 1.Tighter credit lines – It started in 2008 when banks quietly pulled back their lines of credit to small businesses. Without so much as a peep, companies that relied on $100k, $200k or $500k lines of credit to ease the changing tides of their cash flow suddenly found the financial rug pulled out from under them. Additionally, credit card companies drastically lowered credit limits on business cards to reduce their risk exposure in the small business market. The results made finding money much harder for business owners coupled with “higher than posted” interest rates (for those lucky enough to be approved for such loans/lines of credit). 2.Hidden costs of doing business keep going up – Gas, energy, insurance, overnight delivery service, travel and paper are just a few of the everyday costs that are driving up expenses for small businesses. Take a look at your forecasted expenses for 2013. In all likelihood, the actuals are higher than what you projected at the end of last year. Unfortunately, this is only part 2 of the story. What are you doing to keep expenses in check—cutting fat without cutting muscle or bone? 3.Sales are down or flat – Money is tight and expenses are up. Consumers and businesses are spending only on what they need to keep inventories at low levels. If your sales are up from last year, did the increase come from new business or existing accounts? What will happen to your sales if interest rates rise? what economic indicators are you watching to gauge sales for your company? 4.Slow paying customers – As we get older, people talk about 40 years old as being the new 20 and 50 being the new 30. In A/R terms, Net 60 is the new Net 30 and Net 90 is the new Net 45. When did our customers decide they could start treating us as their second bank? Business-owners nationwide report that slow paying customers are one of the main reasons they are in financial distress. Unfortunately, it only adds to the company’s woes as many business owners cannot add interest charges to their customer’s accounts for fear of losing that customer altogether. In a double whammy, these same small business owners ARE being charged interest for late payments on their accounts. The span between A/P and A/R is getting wider and wider. Companies that specialize in “factoring,” where receivables are sold at a discounted rate, are growing in almost every part of the country. How is your business doing in the battle of A/P vs. A/R? 5.Credit scores go down; Banks put your company in the “at risk” pool; you can’t get a new loan/line of credit – This is the result of parts 1-4. If you started your business prior to 2008, then you probably experienced a significant correction in your growth plans as well as fewer financial options. What has changed between then and now that would give you an unusually optimistic view of the future? For years, I was a “glass half-full” kinda guy. But the reality of the great recession and a sluggish recovery turned me into a realist. I don’t look at the glass at all anymore. I stress test my business by asking tough questions. If I don’t have the answers, I find them. How about you? Brian Moran, Founder & CEO of Brian Moran & Associates, helps entrepreneurs run better businesses and marketers do a better job reaching entrepreneurs. He’s been involved in small business & entrepreneurship for almost 25 years. His company web site is www.smallbusinessedge.com and you can find him on Twitter @BrianMoran. It’s getting crowded in the crowdfunding pool! 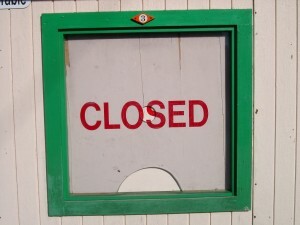 Sometimes it is really frightening to see the many ways that a small business can get hampered. I only recently incorporated myself, and I have yet to consider the credit risks that I face down the road. However, I also know that small businesses are essential and that we know live in a time where you can really make a big impact with a well thought out business strategy for your small business. For me, I am doing a lot of work online, and I think that this can help me overcome many of the factors which can derail small businesses. Hi Stephen – Sorry I’m so late in replying to your comment. Thank you very much for leaving it. Fear will always be a part of running a small business. It knocks on your door every single day. Your job is to not let it in your business. You can do this by having a business plan that acts as a GPS system. It should tell you where to go and how to get there. That way, when business gets chaotic and you lose a large account or the bank calls in a loan, open up your business plan, plug in the new information and see what you need to do in order to get to your destination. The more detailed your plan, the more likely you are to achieve your goal and the less you worry about fear and risk. Good luck! !